Since 1995, over $200,000 of 20th Century Fund monies have been dispersed to AFTCA Member Clubs for the improvement of upland game bird habitat and field trial grounds as well as for educational purposes that have benefitted amateur field trials. The Fund Committee carefully reviews each application giving special attention to clubs that host National Amateur Championships. This important support of amateur field trials is only possible through the generosity of AFTCA members. Donations to the Fund are possible through many avenues: endowments, memorials, per dog fees and simple donations that can be made online here on our secure website. In addition, the Print Program is another excellent method. Many thanks to those individuals who stepped forward to become print benefactors. It is through their generosity, that this whole program is possible. As a print purchaser, not only do you receive a handsome print of your choice at the affordable price of $200, but your purchase is a tax deductible contribution as permitted by law. These prints make great gifts for judges, reporters and field trial honorees and collectors of field trial art. Please keep the 20th Century Fund in mind when considering your year-end tax deductible contributions. In addition, please ask your member club and its members to support the Print Program. Our goals are always the same “The Betterment of Field Trials”. 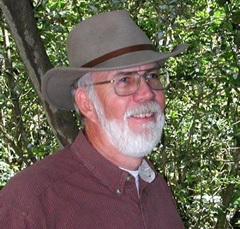 In 1994, Virginia field trialer, Andy Crowell undertook the 20th Century Fund Print Project and enlisted benefactors who underwrote the commission of the original paintings by Texas wildlife artist Herb Booth and the production of the print edition of each original. The first painting was through the generousity of Tom Honecker. Named Cedar Oak, the print depicts Tom’s National Champion, Cedaroak Kate. 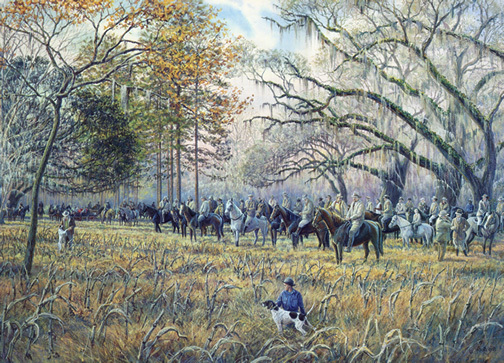 The following year, Julie Ripley Miller funded Breakaway at Dixie illustrating an early 1950s scene from Dixie Plantation. 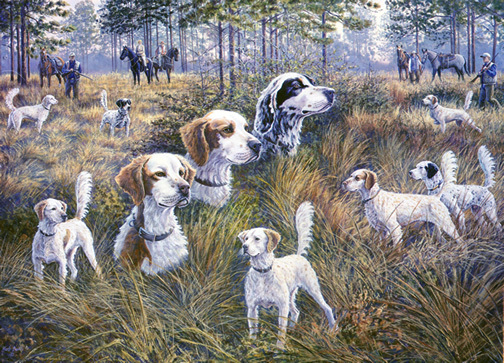 Next came the famed Legacy of Smith Setter Champions, followed by Tommy and Bonnie Hamilton’s contribution that resulted in the beautiful Silverton Hill, depicting their Hamilton’s Big O and Hamilton’s Blue Diamond. 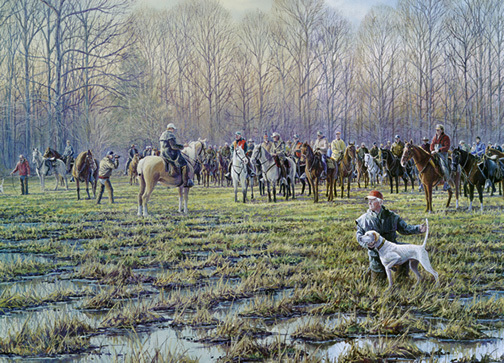 The final print edition is from the painting commissioned by John and Susan Ivester titled Millennium Breakaway at Ames that shows their 2000 National Championship winning pointer, Marques Gold Rush at the breakaway on the famed Ames Plantation in Grand Junction, TN. 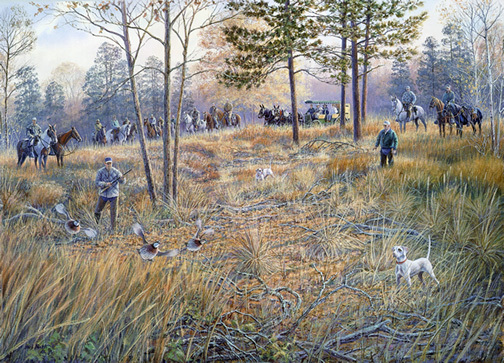 The sixth print Shooting at Chinquapin depicts a quail hunt on Ted Baker’s famed Chinquapin Farm. 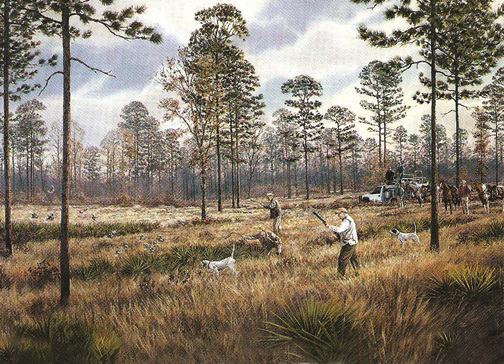 Texas wildlife artist Herb Booth, who painted all five beautiful field trial scenes passed away on December 5, 2014. He left an amazing legacy of artwork that is ever increasing in value. Author Michael McIntosh spoke in glowing terms about Herb: “It is a peculiar fact of sporting art it cannot be successfully faked. 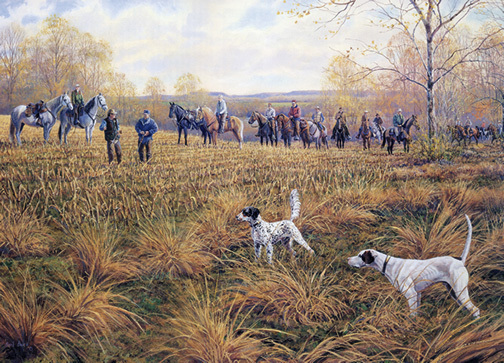 A sporting scene, if it aspires to any degree of acceptance, must not only reflect genuine experience on the artist’s part but must also evoke the memory and feeling of similar experience in the viewer.” In Booth’s art the sense of authenticity and depth of personal experience are instantly recognizable. The print editions are of 1,000. All profits from the print sales go directly to the Fund. Over the years, sales from the prints have substantially increased the amount of grant money given to amateur field trial clubs around the country to improve habitat and enhance their venues. A great appreciation is owed to the benefactors of this highly successful program. 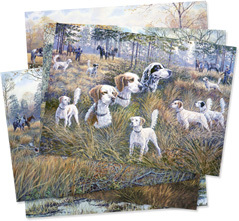 Prints make wonderful gifts to friends any time of the year and are a great option for field trial judges and reporters. What better than to give a beautiful print of a painting by one of the country’s most renowned wildlife artists and at the same time benefit field trials?